Climate shenanigans at the ends of the Earth: why has sea ice gone haywire? There is no doubt that 2016 has been a record-breaking year for Earth’s climate. We will have to wait another couple of months for the final tally, but 2016 will be the hottest year in recorded history globally. Average temperatures are well above 1℃ warmer than a century ago. Global average temperatures, and “global warming”, often give the impression of a gradual change in Earth’s climate occurring uniformly across the planet. This is far from the truth – particularly at the ends of the Earth. The Arctic and Antarctic are behaving very differently from the global picture. 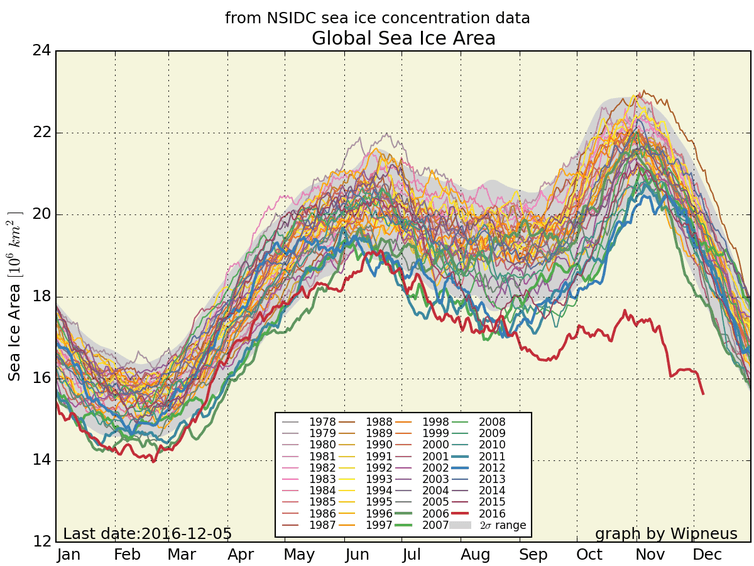 But in the past few months its seasonal progression has stalled, plunging Earth’s sea ice cover off the charts to the lowest levels on record for November. 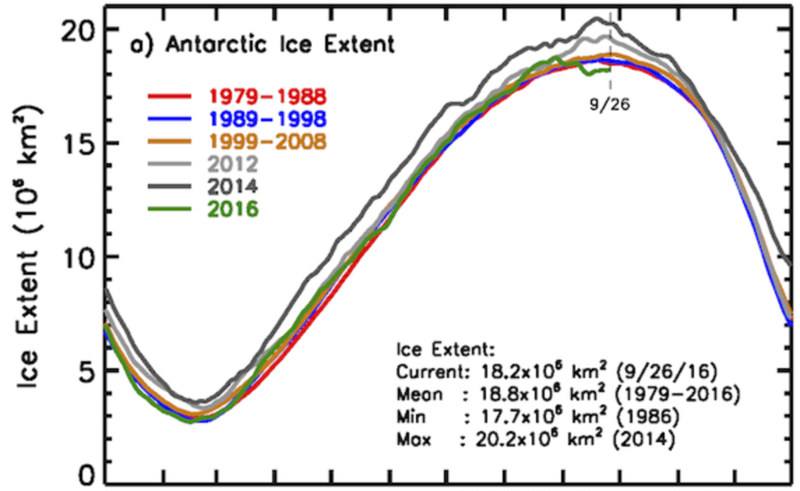 Explaining what has caused this unexpectedly dramatic downturn in sea ice is a tale of two poles. Global sea ice area (including Antarctica and the Arctic) by year, 1977-2016. National Snow and Ice Data Centre. The northern polar region is an epicentre for change in our warming world. On average, the Arctic is warming at around twice the global average rate. This is due to several environmental processes in the Arctic that amplify the warming caused by rising atmospheric greenhouse gas levels. One of these amplifiers is the sea ice itself. As the climate warms, it’s no surprise that ice melts. What is less obvious is that when bright, white ice melts it is replaced with a dark surface (the ocean or land). Just as a black car parked in the sun will warm up faster than a white one, so the dark surface absorbs more heat from the sun than ice. This extra heat promotes more ice loss, and so the cycle goes. This can explain the marked long-term decline of Arctic sea ice. But it can’t explain why the past month has seen such a sudden and dramatic change. For this we need to look to the weather. Arctic climate is characterised by very large natural swings – so much so that in the past few weeks some regions of the Arctic have been a whopping 20℃ warmer than expected for this time of year. The polar regions are separated from milder equatorial climates by a belt of westerly winds. In the northern hemisphere these winds are commonly referred to as the jet stream. The strength of the jet stream is related to the north-to-south (cold-to-warm) gradient in northern hemisphere climate. The amplification of warming in the Arctic has reduced this gradient, and some scientists believe that this is allowing the northern jet stream to develop a more meandering path as it travels around the globe. 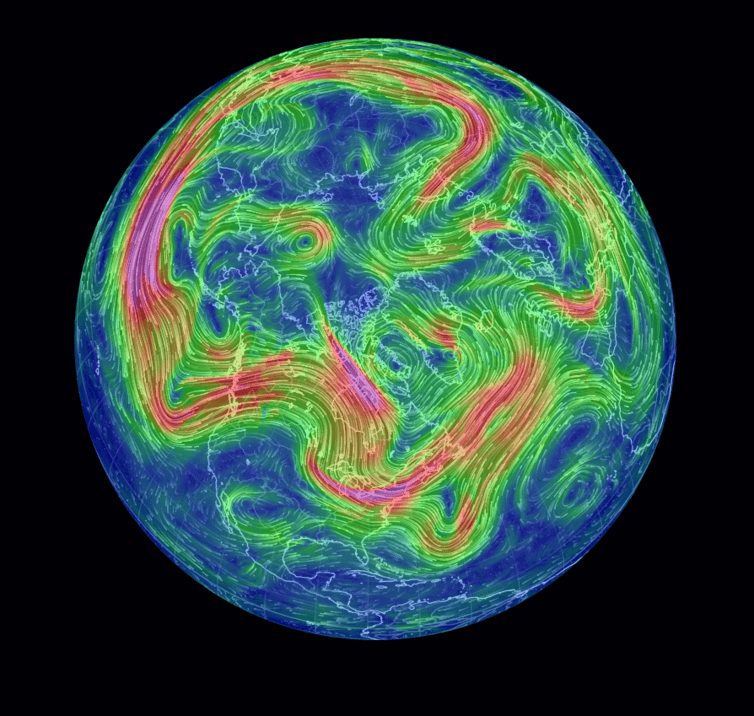 Jet stream winds in the northern hemisphere, November 11 2016. Screenshot from Global Forecast System/National Centres for Environmental Information/US National Weather Service. A weaving jet stream allows warm air to penetrate further northwards over the Arctic (the flip side is that extremely cold polar air can also be pulled south over the northern hemisphere continents, causing extreme cold snaps). This appears to be responsible for the current extremely warm temperatures over the Arctic Ocean, which have caused the normal advance of winter sea ice to stall. In effect, what we are seeing in the Arctic is the combined effect of long-term climate change and an extreme short-term weather event (which itself is probably becoming more common because of climate change). It’s a different story when we look at the ocean-dominated southern hemisphere. Antarctic climate records point to a delay in some of the effects of “global warming”. The reasons are still debated, partly because of the much shorter climate records that scientists have to work with in the Antarctic. But it is likely that the expansive Southern Ocean is an important climate change dampener that is able to “hide” some of the extra heat being absorbed by our planet beneath the ocean surface where we don’t feel it – yet. Unlike the dramatic declines in Arctic sea ice over recent decades, the sea ice that surrounds Antarctica has been increasing slightly over the past three-and-a-half decades and 2014 set records for the most extensive Antarctic sea ice on record. So the decline in Antarctic sea ice since August this year to record low levels has come as somewhat of a surprise. Again, the weather may hold part of the answer. The westerly winds that circle the Southern Ocean (analogous to the northern hemisphere’s jet stream) have strengthened and moved closer to Antarctica over the past few decades. One of the effects of this has been to push sea ice away from the Antarctic continent, making for a more expansive coverage across the surrounding ocean. But the westerly winds are fickle. They are able to change their path across the Southern Ocean very quickly. And so while the southward march in their average position over many years is clear, predicting their behaviour from month to month remains difficult. This spring the westerly winds have tended to sit closer to Australia and out of reach of Antarctica’s sea ice. What Antarctica’s sea ice will do in the future is still an open question. Climate models indicate that Antarctica won’t remain protected from global warming forever, but just if and when this might cause Antarctica’s sea ice to replicate the Arctic sea ice loss is still anyone’s guess. Extreme years, such as 2016, are important as they provide glimpses of what the new normal of our climate system may look like in the not-too-distant future. But these pointers to where we are going also need to be assessed in terms of where we have come from. For sea ice, logbooks from the age of heroic exploration suggest that the Antarctic system is mostly still operating within its normal bounds. The same cannot be said for the Arctic. The decline of sea ice there has been likened to a ball bouncing down a bumpy hill – some years it will bounce higher than others, but eventually the ball will reach the bottom. When it does, the Arctic Ocean will be ice-free in summer. That’s a boon for shipping, but don’t expect to see any polar bears on those Arctic cruises. 2016 continues to be a momentous year for Australia’s climate, on track to be the new hottest year on record. To our south, Antarctica has also just broken a new climate record, with record low winter sea ice. After a peak of 18.5 million square kilometres in late August, sea ice began retreating about a month ahead of schedule and has been setting daily low records through most of September. It may not seem unusual in a warming world to hear that Antarctica’s sea ice – the ice that forms each winter as the surface layer of the ocean freezes – is reducing. But this year’s record low comes hot on the heels of record high sea ice just two years ago. Overall, Antarctica’s sea ice has been growing, not shrinking. So how should we interpret this apparent backflip? In our paper published today in Nature Climate Change we review the latest science on Antarctica’s climate, and why it seems so confusing. Antarctica’s sea ice has reached a record low this year. First up, Antarctic climate records are seriously short. The International Geophysical Year in 1957/58 marked the start of many sustained scientific efforts in Antarctica, including regular weather readings at research bases. These bases are mostly found on the more accessible parts of Antarctica’s coast, and so the network – while incredibly valuable – leaves vast areas of the continent and surrounding oceans without any data. In the end, it took the arrival of satellite monitoring in the 1979 to deliver surface climate information covering all of Antarctica and the Southern Ocean. What scientists have observed since has been surprising. 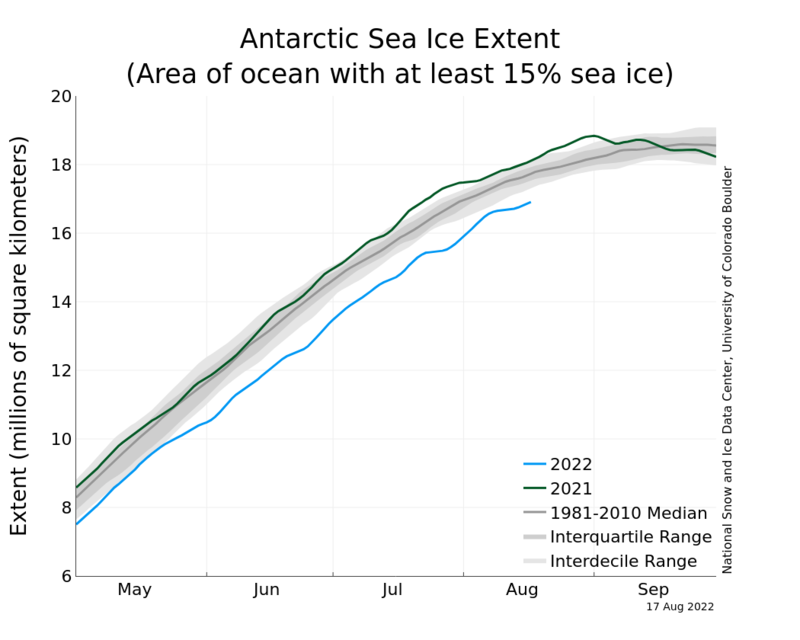 Overall, Antarctica’s sea ice zone has expanded. This is most notable in the Ross Sea, and has brought increasing challenges for ship-based access to Antarctica’s coastal research stations. Even with the record low in Antarctic sea ice this year, the overall trend since 1979 is still towards sea ice expansion. The surface ocean around Antarctica has also mostly been cooling. This cooling masks a much more ominous change deeper down in the ocean, particularly near the West Antarctic Ice Sheet and the Totten glacier in East Antarctica. In these regions, worrying rates of subsurface ocean warming have been detected up against the base of ice sheets. There are real fears that subsurface melting could destabilise ice sheets, accelerating future global sea level rise. In the atmosphere we see that some parts of the Antarctic Peninsula and West Antarctica are experiencing rapid warming, despite average Antarctic temperatures not changing that much yet. In a rapidly warming world these Antarctic climate trends are – at face value – counterintuitive. They also go against many of our climate model simulations, which, for example, predict that Antarctica’s sea ice should be in decline. The problem we face in Antarctica is that the climate varies hugely from year to year, as typified by the enormous swing in Antarctica sea ice over the past two years. This means 37 years of Antarctic surface measurements are simply not enough to detect the signal of human-caused climate change. Climate models tell us we may need to monitor Antarctica closely until 2100 before we can confidently identify the expected long-term decline of Antarctica’s sea ice. In short, Antarctica’s climate remains a puzzle, and we are currently trying to see the picture with most of the pieces still missing. But one piece of the puzzle is clear. Across all lines of evidence a picture of dramatically changing Southern Ocean westerly winds has emerged. Rising greenhouse gases and ozone depletion are forcing the westerlies closer to Antarctica, and robbing southern parts of Australia of vital winter rain. The changing westerlies may also help explain the seemingly unusual changes happening elsewhere in Antarctica. The expansion of sea ice, particularly in the Ross Sea, may be due to the strengthened westerlies pushing colder Antarctic surface water northwards. And stronger westerlies may isolate Antarctica from the warmer subtropics, inhibiting continent-scale warming. These plausible explanations remain difficult to prove with the records currently available to scientists. The combination of Antarctica’s dynamic climate system, its short observational records, and its potential to cause costly heatwaves, drought and sea-level rise in Australia, mean that we can’t afford to stifle fundamental research in our own backyard. Our efforts to better understand, measure and predict Antarctic climate were threatened this year by funding cuts to Australia’s iconic climate research facilities at the CSIRO. CSIRO has provided the backbone of Australia’s Southern Ocean measurements. As our new paper shows, the job is far from done. A recent move to close Macquarie Island research station to year-round personnel would also have seriously impacted the continuity of weather observations in a region where our records are still far too short. Thankfully, this decision has since been reversed. But it isn’t all bad news. In 2016, the federal government announced new long-term funding in Antarctic logistics, arresting the persistent decline in funding of Antarctic and Southern Ocean research. The nearly A$2 billion in new investment includes a new Australian icebreaking ship to replace the ageing Aurora Australis. 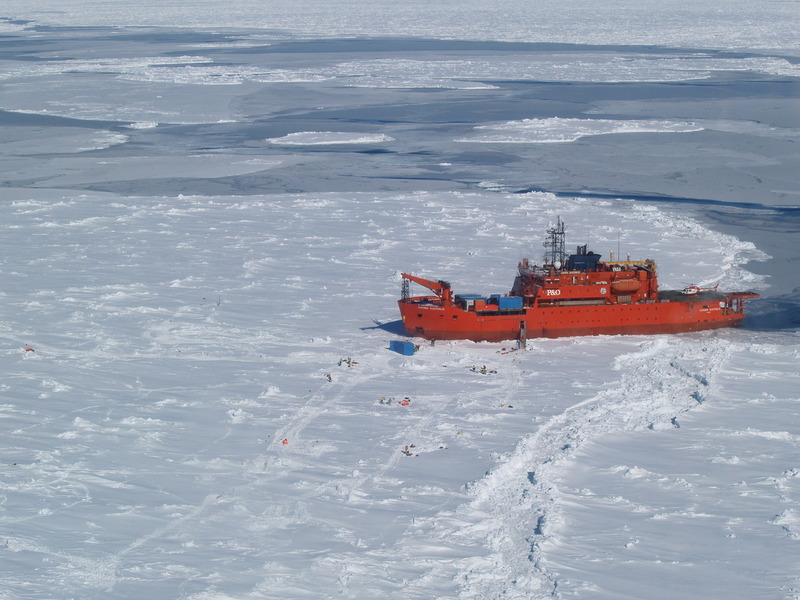 This will bring a greater capacity for Southern Ocean research and the capability to push further into Antarctica’s sea ice zone. Whatever the long-term trends in sea ice hold it is certain that the large year-to-year swings of Antarctica’s climate will continue to make this a challenging but critical environment for research. Arctic sea ice levels last winter recorded their lowest peak since satellite monitoring began in 1979, U.S. scientists said Thursday. According to the University of Colorado’s Snow and Ice Data Center, Arctic ice levels crowned on Feb. 25 with a maximum extent of 14.54 million sq. km — 130,000 sq. km less than the previous record low set in 2011, and 1.1 million sq. km lower than the 1981-2010 recorded average. The drop was also widespread, with below-average ice levels recorded everywhere except for the Labrador Sea between Greenland and Canada and the Davis Strait slightly further north.